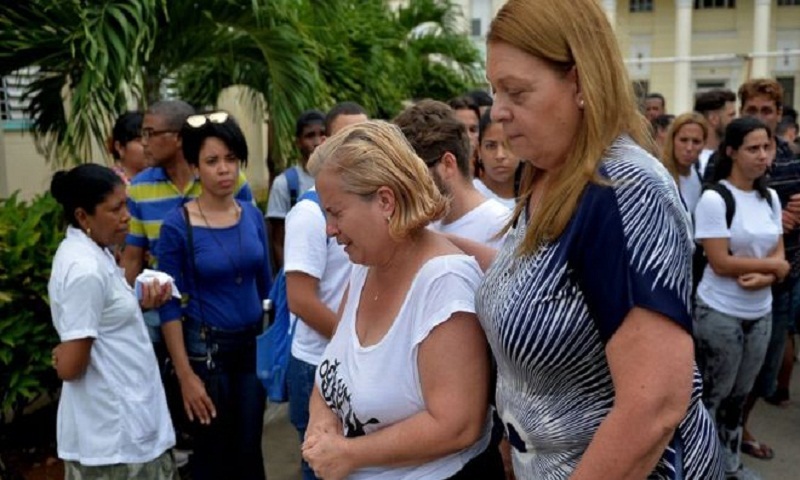 The death toll of Cuba's deadliest air disaster in 30 years has risen to 111 after one of the survivors died of her injuries on Monday evening. The news comes on the same day that Mexico's civil air authority suspended the operations of a company that owned the plane involved in the crash. Officials said in a statement that Aerolíneas Damojh was under "extraordinary verification". The charter company had leased the aeroplane in question to Cuban state airlines Cubana de Aviación. Speaking to the BBC outside the hospital, Ms Landrove's mother, Amparo Font, described her daughter as a fighter. But her death was announced shortly afterwards. Ms Landrove was one of three initial survivors of Friday's crash. The other two - Mailen Diaz, 19, and Emiley Sanchez, 39 - remain in a critical condition, according to reports. The plane was reportedly built in 1979. One former pilot said it had dropped off radar once, while another alleged that maintenance was poor. The Mexican General Directorate of Civil Aviation (DGAC) statement, in Spanish, says the authority will seek information to help the crash investigation, and about whether the Mexican company continues to follow regulations. It says Aerolíneas Damojh was subject to previous investigations: in 2010, due to a crash in Puerto Vallarta, and in 2013 following a complaint from an airline pilot. The authority has run "annual checks" on Aerolíneas Damojh, the statement reads, with the most recent in November 2017. All aircraft have to renew their airworthiness certificates every two years. The head of Guyana's civil aviation body, Cpt Egbert Field, told the Associated Press news agency that the plane that crashed had been barred from using Guyanese airspace last year after authorities found its crew were overloading luggage on flights in Cuba. The plane crashed after taking off from Havana airport. It was a scheduled internal flight to the Cuban town of Holguin. All six crew members were Mexican, while the majority of passengers were Cuban. An Argentine couple and two passengers from the dispute territory of Western Sahara were also killed, as was a Mexico tourist.